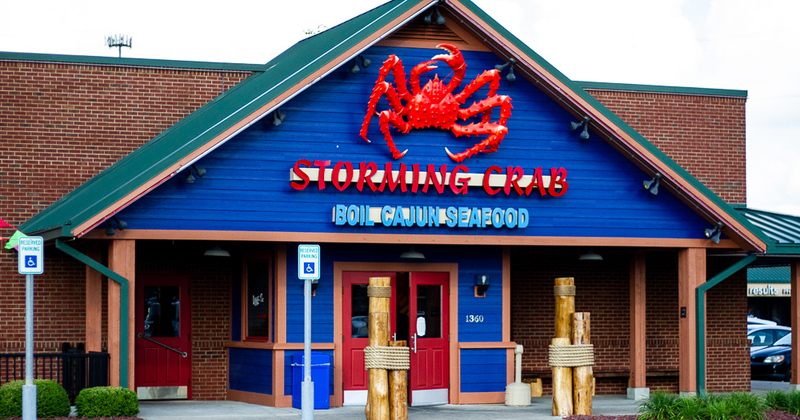 Saying the new Storming Crab opened at 1360 Veterans Pkwy in Clarksville to a warm reception would be an understatement. The anticipated Cajun seafood restaurant opened June 27 and maintained a packed house through the weekend. 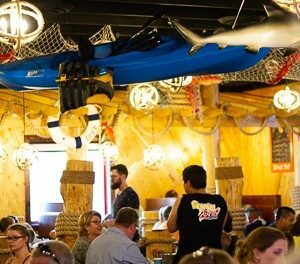 There was about a 40 minute wait when we stopped in Sunday evening at about 7 p.m. and every seat, booth and bar stool was taken. By the time we left, the crowd had not slowed. I brought a friend with me who enjoys hot and spicy food, and I planned to try one of their “no-heat” flavors, because I’m kind of a sissy. 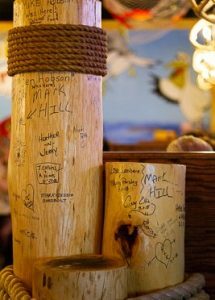 We spent our time waiting by taking in the decor, which included a lot of nets with plastic sea life in them, a mounted shark’s head, some painted murals, spinning projected logos on the floor, and wooden piers already featuring hundreds of sharpie signatures. So, we took a moment to leave our own. The bar featured the liquors you would expect from most bars in the area with two custom cocktails on the board: a crawfish bloody mary and a Storming Jay. 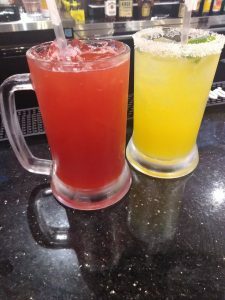 Not being a big fan of bloody marys, I sampled the beachy colorful Storming Jay, which consists of Bacardi light rum, Myers dark rum, Southern Comfort, citrus juices, grenadine, Amaretto, and ginger beer. It reminded me of Flavor Ice frozen treats in flavor, although it’s not a frozen drink. It was very sweet. If you are a fan of very sweet punch drinks, you’ll most likely want to give it a shot. 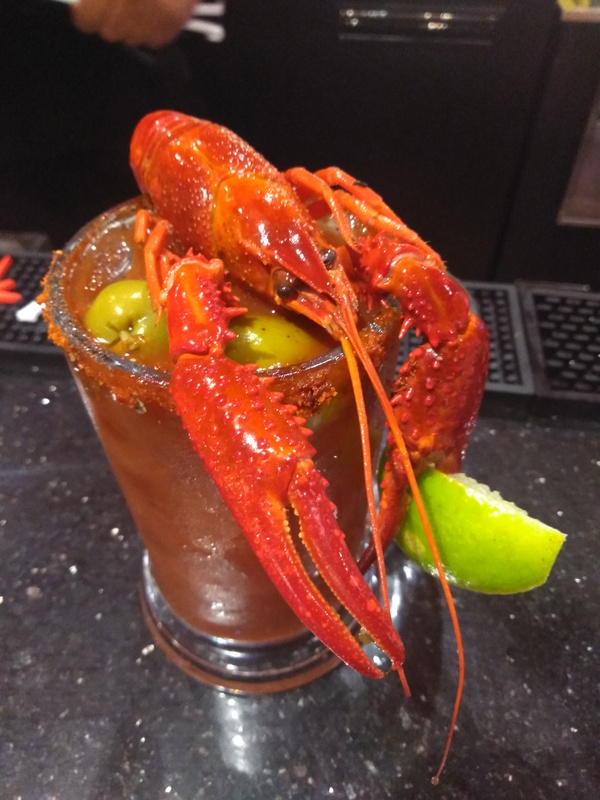 The Crawfish Bloody Mary at the Storming Crab in Clarksville, IN. The menu features common appetizers expected in seafood restaurants, but I wanted to try the seafood bread and boudin balls. 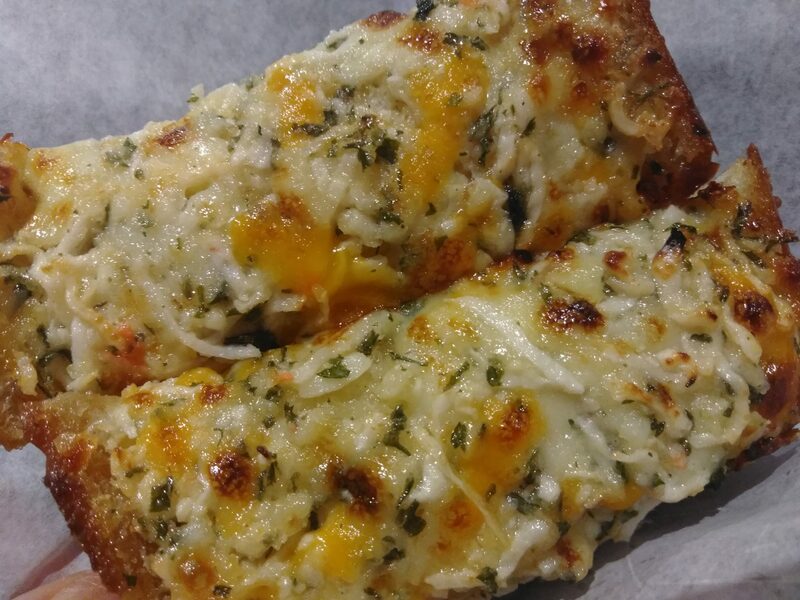 Every customer gets one free slice of the seafood bread, which is a very buttery cheesy bread with added crabmeat. I was an instant fan and was just as pleased with the boudin balls, which are similar to arancini. 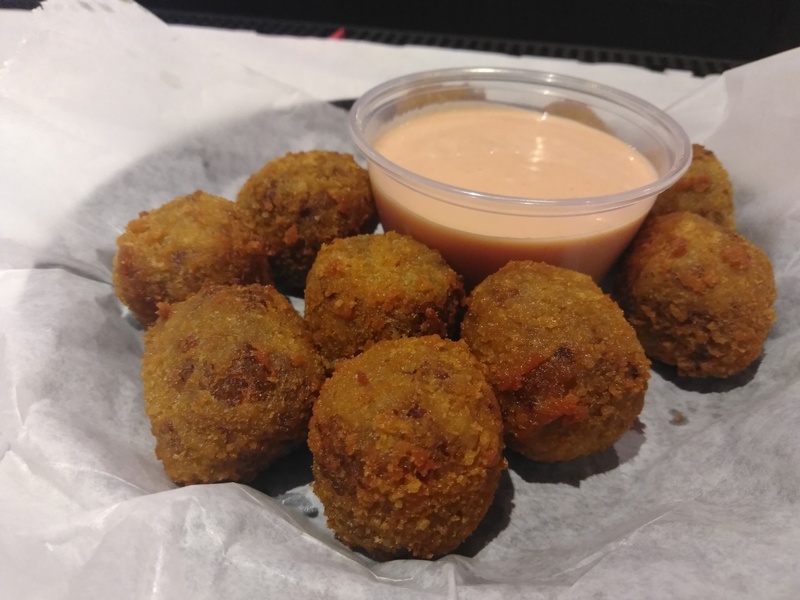 They are breaded pork and rice sausage rolled into balls and fried. They have a slight heat to them — nothing this sissy couldn’t handle — and are served with “house sauce,” with tasted similar to thousand island. The entree prices are on a board above the bar, because the market prices shift and change for wild-caught seafood. 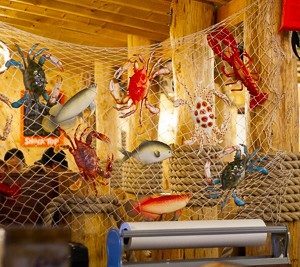 Currently, the prices on the board for a pound of seafood like blue crab, shrimp, clams, or mussels range from $10.99 to $15.99. 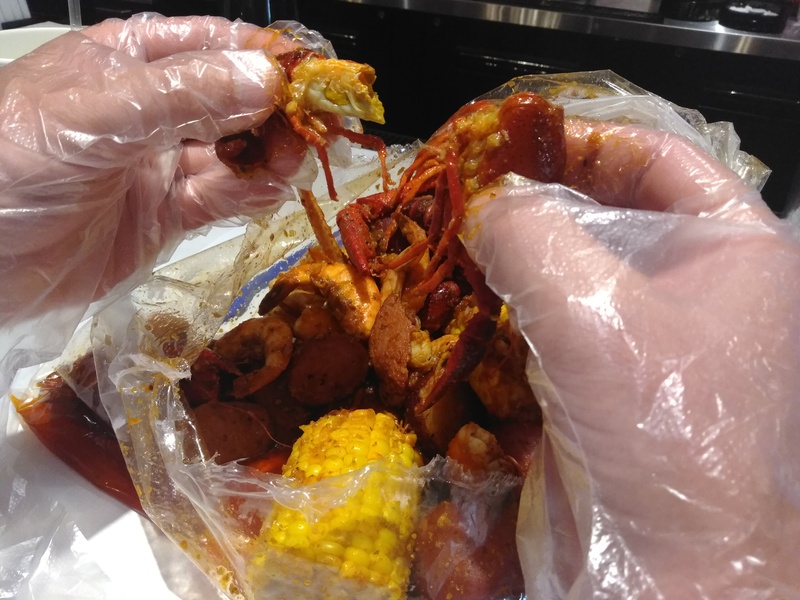 Prices for individual plates like a whole Dungeness crab, lobster tails, snow crab, king crab or scallops range from 19.99 to 36.99; and prices for the combo bags of mixed seafoods range from 25.99 to $51.99. You can only order less than a pound of the boiled seafood during lunch on the weekdays. 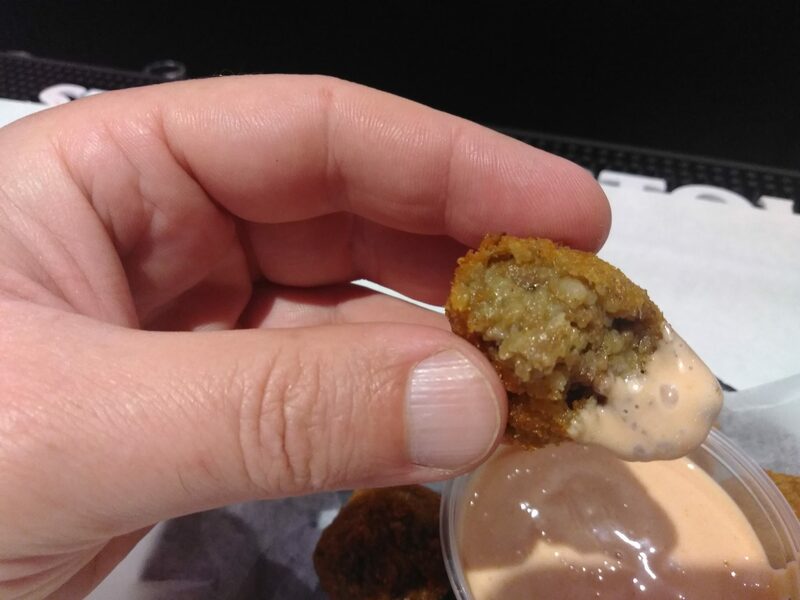 Boudin Balls are pork and rice sausage deep fried. 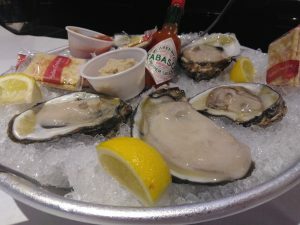 Owner Kevin Weng said it is very important to him to offer wild caught seafood, because he feels there is enough farm raised meat in the midwest. I sampled the fried gator served with a delicious horseradish honey mustard sauce created by Robert Jones, a member of the management team. 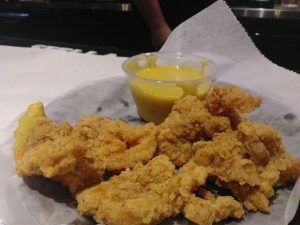 I don’t think I would have liked the gator breading without the sauce. It was pretty dry. Then, we moved on to the boiled seafood. 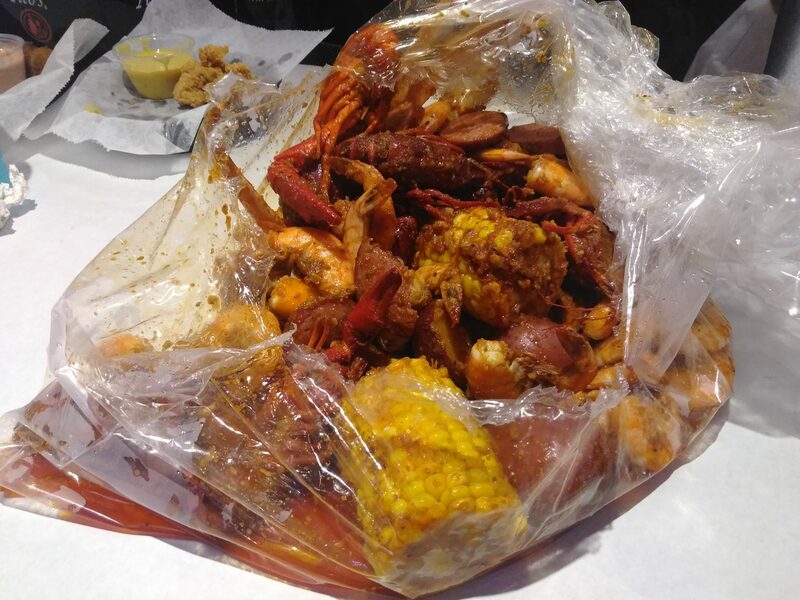 My friend ordered the combo with crawfish, crab, shrimp, and sausage at the highest level of heat “Sam’s Special”, and I ordered the shrimp with snow crab legs, garlic butter flavoring in the pot. 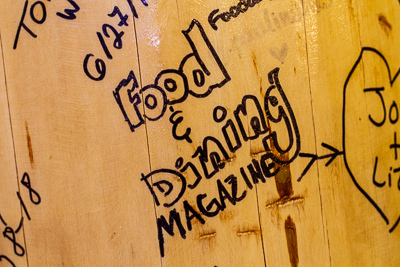 Paper is put down on the table, and the food is brought to you in bags inside of buckets. The bags are placed on the paper, and then an opening is cut into the top of the bag. Then, it’s time to don bibs and gloves and dig in. Despite how busy the restaurant was, our meals arrived with surprising swiftness, and none of the shellfish seemed over or undercooked. The combo platters come with corn and red potatoes, and both were delicious and cooked wonderfully. If you want a little more flavor on anything, there are plenty of juices in the bottom of the bag you can dip your food into. I enjoyed my garlic butter flavoring — especially with the snow crab meat, but I also decided to try a few bites of my friend’s dinner (which was completely covered in seasoning) to see how hot the spices might be. I will say that the “Sam’s Special” level of heat isn’t anything for a fan of spice to be scared of. I wouldn’t be able to eat a whole dish of it, but I easily survived a few bites without crying for relief. My friend said it was hot but not that bad; he really enjoyed the seasoning. His sinuses were definitely clear, and his nose was running a little by the time he was finished. We both agreed it was impressive how the boiled seafood was cooked to perfection while they were so busy, because it’s so easy to overdo it. The menu options for boiled seafood is for one pound of food, so you might plan to share with someone or have leftovers to take home. Our leftovers were tied off in their bag, and then placed inside another bag, which was tied off as well. The gator bites and boudin balls were put into boxes, but I wanted to try a unique dessert before leaving. Although, the menu offers ice cream and cheesecake, I was drawn to the mochi cake – a japanese rice delicacy. Cake is a misnomer. It’s more like a gummy treat. 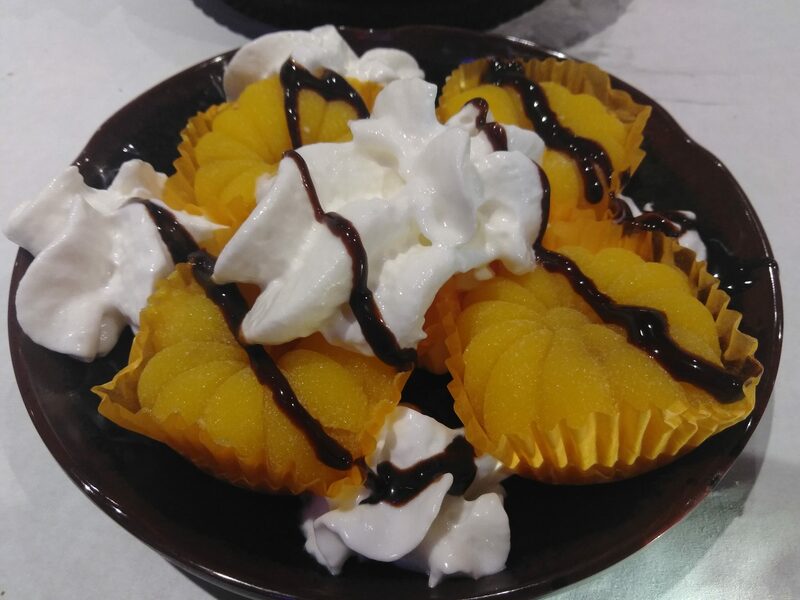 The mango flavored dessert was served cold with whipped cream and chocolate on top, and I found it to be a very interesting texture and flavor. The outer layer is more firm with a fruit gooey center. I’m not sure I would choose the whipped cream and chocolate to go on top of it, but I don’t know what I would replace it with. I enjoyed this new dessert experience, and I found the overall experience to be one I would return for. 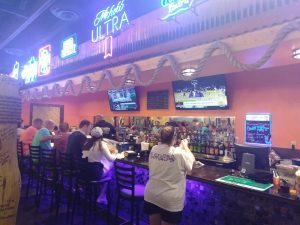 Knowing that Clarksville restaurants are always busy, I would definitely recommend planning for a wait at this new and exciting spot.